All You Need Is Love-The Beatles | Wedding Wisdom, Etc. 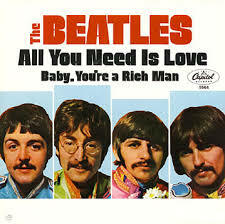 “All You Need Is Love” is one of the Beatles’ most iconic recordings. The song was released in 1967 and was supposed to be an anthem for socio-political optimism for peace and love. Unfortunately, John Lennon’s words weren’t exactly taken quite as optimistically as intended. For more of what happened the following year, read on. Not surprisingly, “All You Need Is Love“ is the most-often requested bridal recessional by my brides and grooms. And between the message of the song, and the pure joy of the moment, it really is the perfect bridal recessional. However, the song remains a reminder of the eternal hope that “love” will prevail. The idea that “All You Need Is Love” will always be a beautiful, if naive, notion. Love is all you need.